The International TranStar is a 8 Class heavy duty truck designed for regional haul and city urban delivery applications. The truck features an aerodynamic design with a conventional cab configuration and the most spacious interior in its class. 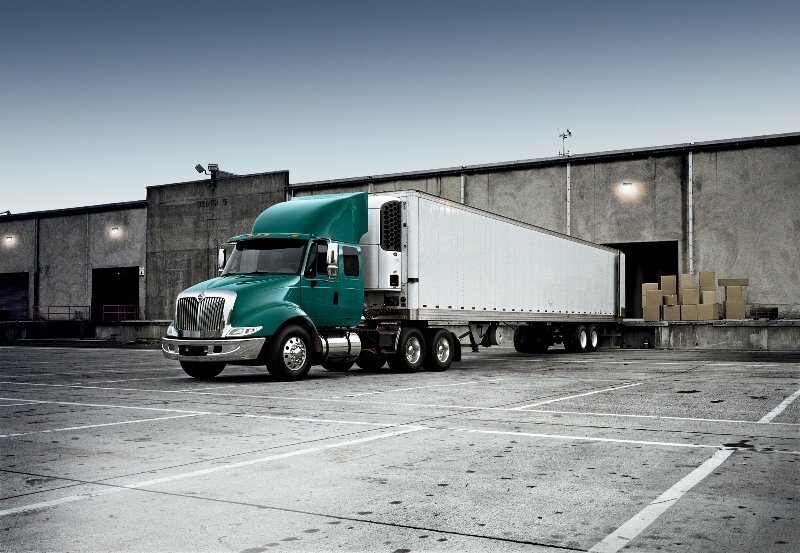 The International TranStar line includes two different models namely the 8500 and 8600. The truck is available with both Day and Extended cabs and is powered by MaxxForce 11 or MaxxForce 12 engines. 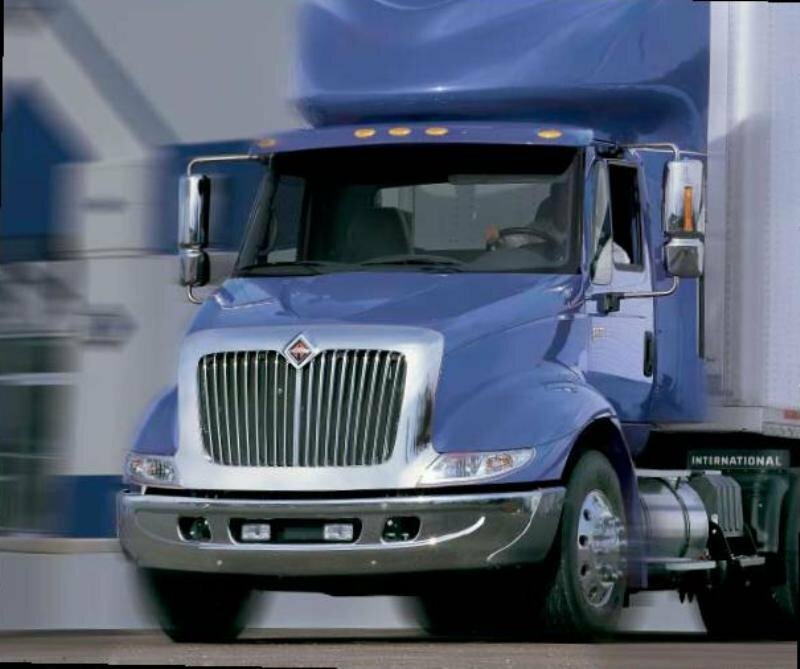 For an enhanced flexibility, the International TranStar is also fitted with International’s programmable Diamond Logic electrical system which allows for automation of headlights, suspension dump valve, air slide fifth wheels, power door locks and more. The International TranStar features a conventional cab configuration and a double-sided galvanized steel cab. The overall design keeps all the common details of the International design language with a lot of fluid lines and the typical sleek headlights which give the truck a dynamic stance. The massive front grille features is chromed, while the bumper also shares the same shiny treatment. The company says that in case of damage, the chromed grille can be replaced independently in less than 15 minutes. The long nose is combined with big, oversized wheel arches which gel well with the rest of the truck and enhance the vehicle’s aerodynamics. Moreover, the bonnet is heavily raked and the 2,038-sq-inch windshield is curved, further improving the truck’s aerodynamics and the straight road visibility. As most trucks in the segment the hood tilts open to a 90 degree angle, providing easy under-hood access and routine maintenance checks. Furthermore, all the service fill points can be accessed without problems from ground level. To be easy to replace and also more cost efficient the hood features a three piece design and is made of a lightweight material. The cabin is typically International, with a slightly angled dashboard and rock hard plastics. The build quality and the overall ergonomy aren’t something to rave about, but you won’t have major in reaching the main controls as they are placed pretty close the driver’s seat. Needless to say, that you have plenty of space and the TranStar’s cab is among the most spacious units in the segment measuring 72.5" wide and 58" height (floor to ceiling). The optional 26 inch extended cab can be fitted with a lift-up bunk which apart from despite its relatively narrow dimensions offers a satisfactory comfort for a full grown adult. Despite the fact that the seats lack any significant side support, they are pretty comfortable and you have plenty of head-, shoulder- and belly room. For enhanced comfort the seats feature a high-back configuration with integrated headrests and also come with a few handy adjustments. We’re not big fans of the dated steering wheel, but at least it can be adjusted for both reach and rake, thus offering an adequate driving position. The all round visibility is top notch, thanks to the big windshield and the massive door mirrors. For enhanced visibility there are also available additional exterior mirrors mounted on the wheel arches at the front of the truck. We don’t have any complains about the instrument cluster either, as it is fairly easy to read and is fitted with big and clear gauges. There are two interior trims available for the International TranStar namely the Deluxe and Premium. The Deluxe model features easy-to-clean molded interior surfaces, two large overhead storage bins, CB storage overhead, center instrument panel bin, driver storage/map pocket and coat hook. The Premium ads an additional storage pocket in the passenger door, compass, outside temperature display, auxiliary visor, door panels with cloth inserts, two additional speakers and individual map lights. The overhead storage area from both trim versions features dual storage pockets with retainer nets and a CB radio pocket. The International TranStar is available with a choice of two MaxxForce engines, namely the 11 and 13 units. The engines develop between 330 hp - 500 hp and can be mated on Eaton Eaton Fuller manual gearboxes or Allison automatic transmissions. TO be able to cope with the heavy duty missions without backing down the engines can hit the maximum torque form as low as 1000 rpm and hold it up to 1400 rpm. For enhanced performances and improved fuel consumption, the engines come with a high pressure common rail Fuel system, dual wastegated sequential turbos and a capable heatmanagement system. Furthermore, the MaxxForce engines are built using compacted graphite iron which improves the durability and keeps the weight to a relatively low level. The MaxxForce units are also combined with the Advanced EGR system which delivers 2010 EPA emissions compliance by handling nox reduction inside the engine. The EGR technology works by recirculating cooled diesel exhaust back into the engine, reducing emissions before they come back out. The engines are also available with Jacobs engine brakes which reduce the wear and tear of the service brakes and also improve the truck’s stopping performances. At the front, the International TranStar features Lightweight parabolic taperleaf front springs with a capacity of 12000-14000 lbs, while the rear gets International’s four springs suspensions which can deal with up to 40.000 lbs. The ride is at par with its competitors as the air suspended cabin is able to keep most of the road bumps far from the driver’s seat. The NVH levels are also surprisingly low, as the cabin is well isolated. For enhanced maneuverability the International TranStar features a set-back wide-track axle and a wheel cut angle of up to 50°. The standard power steering is also up to the task and permits you to deal effortless with tight maneuvers. The International TranStar features a strong and versatile frame, capable and efficient engines, and one of the most spacious cabs in its class. The truck can deal pretty well with almost anything you’ll throw at it, while the suspensions and axles are part of the heavy duty class and you can rely on them with confidence. On the other hand, the truck’s reliability isn’t at the same level with models built by Freightliner or even Kenworth.